My Top 30 at 30 Part3!! So yes you read right at the title, I am going to bring you my top 30 products I love now that I am turning 30! (I have actually turned 30 now as my plan to have these all published on the 16th didn't work out!) For anyone that doesn’t know me personally, I am birthday obsessed, I love my birthday! I love other people’s birthday’s too but of course my own is the greatest ever. I think it’s such a nice thing to celebrate the day you became you and Monday the 16th of January I will be me 30 years. I’m excited for this year my 30th year, I will be in full wedding planning mode, it’s the year of me so I’m hoping the blog will grow in 2017 just like I plan to as a person. Anyway… rather than bombard you for 30 products in one post I am going to divide this into 3 so 10 products per post. These products will be a mixture of blogger mail I have received and fallen for (honestly of course) others will be gifts I have gotten and others will be products I have purchased myself and loved. I’m excited to bring these posts because I really do have a lot of products I really like. Just to note, the products won’t be in a preferential order that would be way too difficult and there will be a mix between makeup, hair and skin. Hope you like it! 1. 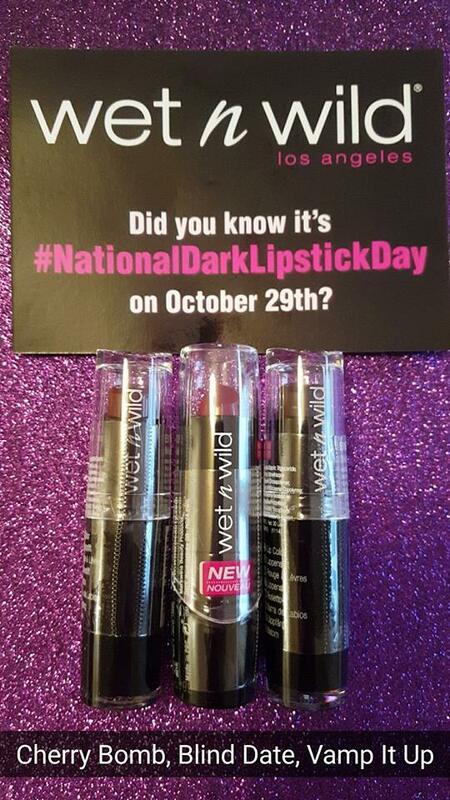 WetnWild Megalast Lipstick: As you can see from the pictures above, these lipsticks are not something new to me. 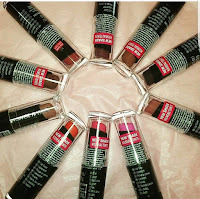 I have over 15 different WetnWild Megalast lipsticks in my collection, I am on my second and thirds of some of the shades, the reason being: they are €2.99 and they are amazing!! Honestly (which is the whole point of this post) they can do no wrong. Well....actually is you have the driest of lips you might want to be careful with using these, just add a little lip balm to your lips first and then use them. What I love most about the megalast lipsticks is how similar they have made the colours to expensive brands like MAC. So basically, when I go on a night out I never bring my expensive makeup. To be honest, I actually rarely bring makeup. I'm too busy posing with my friends and dancing to even worry how the makeup is looking but when you see your snapchats from the end of the night, if your lipstick is gone especially if it's a darker colour, it really doesn't look great. So each time I go out I bring with me a megalast lipstick. Even if it's not the exact colour I'm wearing you can bet it's really similar so during the night I can top up my lips and if I happen to lose the lipstick it's only €3 and not the €20 you may have paid for other brands. They are so long wearing you might only need two top ups in a whole night and I just love them. They are available in Dunnes, Penneys and some pharmacies in Ireland. 2. 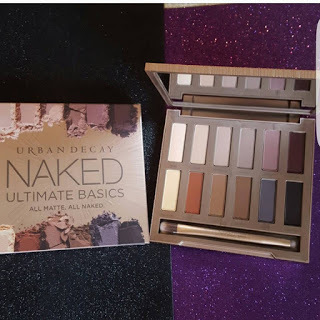 Urban Decay Ultimate Naked Basics Palette: I have reviewed this bad boy already so if you want to read it in full be sure to head over to the blog and search urban decay. It is a brand I am so mad about, yearly launches and purchases are part of my happy place in blogging. This brand has been in my life ever since it arrived to Debenhams in Waterford. Each Christmas a new product came out and my mum would dutifully join the masses to get the latest palette or lipstick or foundation. 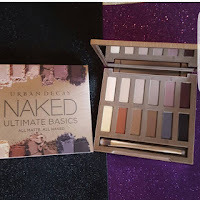 The Naked Ultimate Basics was a palette created after the masses spoke back to Urban Decay. People would buy each Naked palette and wish there were just a few more matte shades in the palette so here we have it. An almost full matte palette with only one shimmer shade for highlight which of course we all appreciate. I have used this palette so much I will deffo hit pan on some of the shades now which is so unlike me but it really is so versatile I think if you are not an urban decay lover already then this is a great starter palette or if you just have a divine love for mattes then again, this is great palette. It always helps that you get a brush with your palette! You can find this on all Urban Decay stands in Debenhams. 3. 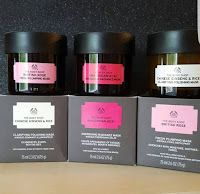 Body Shop Chinese Ginseng & Rice Mask: Firstly I love this picture, I spent ages finally get them into a decent light to take the picture and only after posting it on all my blog social media accounts I realised I had two of the products wrong! Anyway...these three masks were gifted to me a few months back and I started my multi-masking during my pamper evenings. I absolutely love the Ginseng & Rice mask. 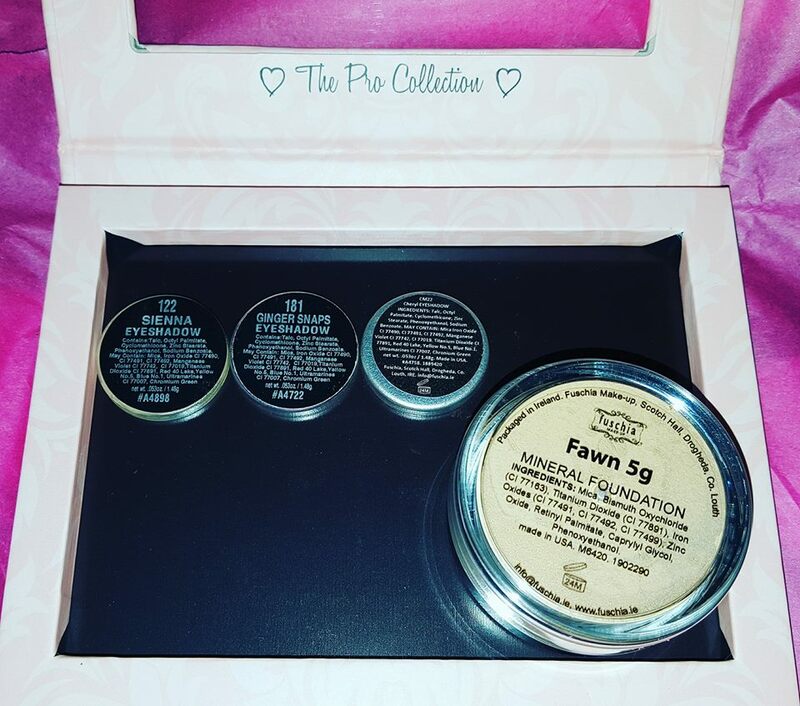 It's very like the GlamGlow mask in consistency, I don't know if the effect is the exact same as to be fair I haven't used them side by side but for me I love this mask. I like the 'clean' feeling the mask gives. I like how it's grainy it is and how it 'sets' on the face. I'm one of those weird people who really enjoys scrubbing off a mask and letting my skin breathe afterwards. Now don't get me wrong the other two masks are great but if I was to pick one out of the three that I have then the Chinese Ginseng & Rice mask is my absolute fave. This is the clearing masks so considering I still get breakouts it gets an extra bonus point. 4. 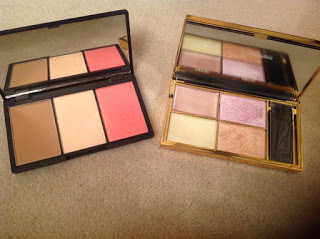 Sleek Highlighting Palettes: Sleek Makeup....It is everywhere! 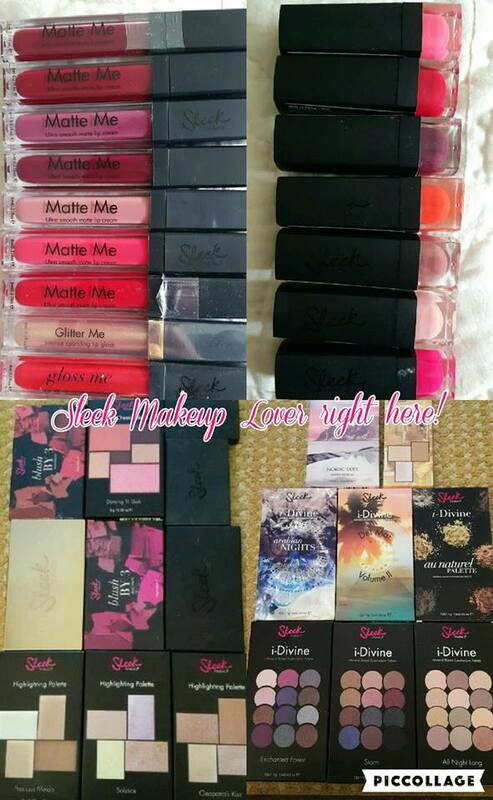 There are so many products in my Sleek collection as you can see from the picture above. I think if I was to pick one product that I feel everyone should own then it would have to be one of the highlighting palettes. It's very hard to pick between the Solstice, The Cleopatra's Kiss or the Precious Metals palette so really you need them all but.. that might be a bit far fetched if you've never tried the brand before. The three palettes come with four shades of highlighter, both creams and powders. You can literally 'glow' if you use enough product but let's face it, that's not for everyone. I love the Solstice palette myself. Although I don't tend to use the purple shade by itself as usual, you can dip into a few of the colours and create a stunning sheen to the cheekbones. Sleek makeup is great value and these highlighting palette retail around €12 so they're a total bargain. I could literally talk about Sleek Makeup for days but if you go through the search bar on the blog and type in Sleek Makeup then you're sure to learn a lot more about the brand and my love for it. Between the eyeshadow palettes retailing at €11 and the Matte Me lipsticks around €6.50 you're sure to find something you love! 5. Dermalogica Daily Microfoliant: Ahhh Dermalogica... the skin lover of my life and not my bank balance. The facials I've had, the products I've used is there anything this brand can't do (apart from slashing prices) but you have to pay for quality and this product is quality!! 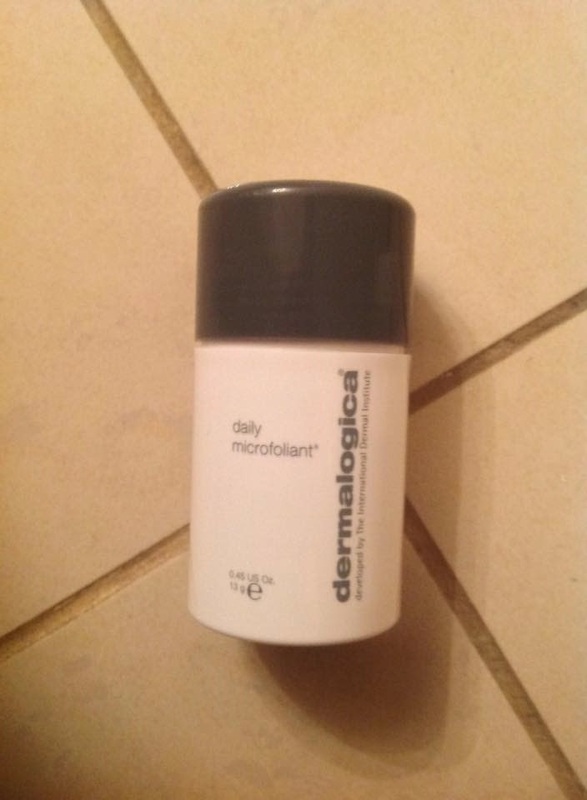 The Dermalogica Daily Microfoliant is included in my routine no matter what other products are in it. I have had the professional sized pot, sample pots and I'm back to the regular retail size pots at the moment. It's a light powder that you mix with a small amount of water to form a paste that you spread over your face and rinse off. I use the microfoliant after my cleanser and before my toner. It's almost like a second cleanse but to be fair if I am wearing a good deal of makeup that day then I will have already used the precleanse from Dermalogica. This product again is a godsend but that's for another day! The daily microfoliant is perfect for my combination skin type and I really feel it's a must for me. 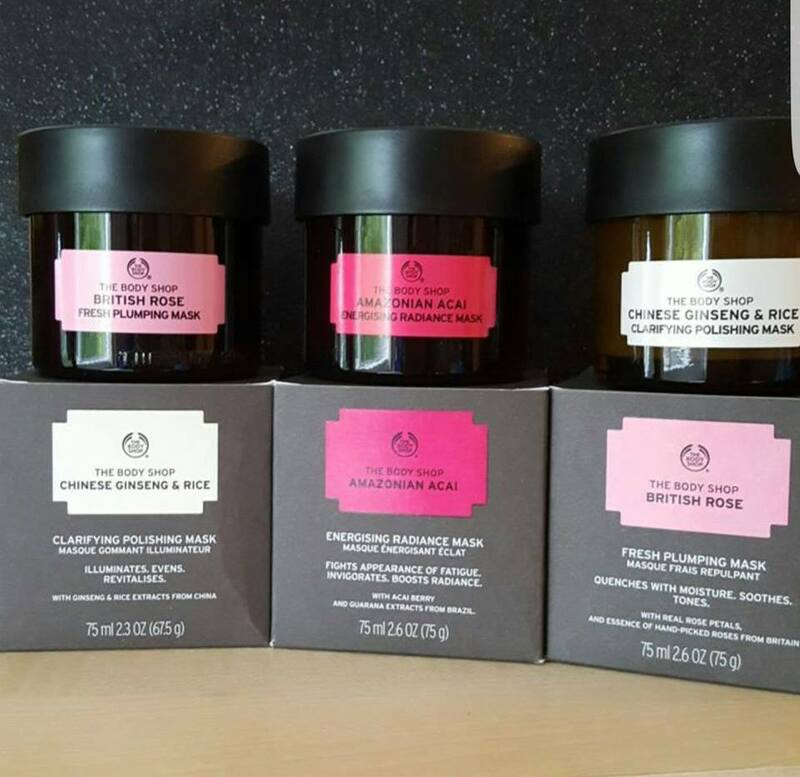 To gently exfoliate the skin is so important to keep it at it's best. I am no skin expert by any means so this is just my humble opinion on one of my very favourite skin products. 6. Bellamianta Dark Mousse: Once in a while a tan will come along and knock other tans out of the water. Bellamianta became the tan of 2016, everyone and their mother was wearing the tan so I followed suit (of course it’s a blogger’s prerogative) I mean I’m more than happy to ‘buy into’ hype because it can be difficult these days to always believe the scripted word of some people so I am always happy to try things myself and get honest about it. I first tried the lotion and gave that a rave review. 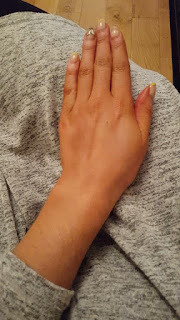 I stand by that review 100% the olive tone actually sat on my skin quite well, the left over colour after the shower is stunning and if you want it really dark then the second layer will have you night time ready in an act. When the dark mousse came out, I wanted it so bad! The mousse for me is easier to use, I find that even though the lotion was super quick trying it’s a little more risky than the mousse. I think I have a mental block to lotions at times because if I apply tan before bed, I get really warm when I sleep so lotion and heat never go! The Bellamianta Dark mousse is the perfect night out tan. It’s a mid-price range tan but so worth the money. I have also gone the whole hog and booked a spray tan of Bellamianta in June for a wedding. Unfortunately the therapist didn’t spray my hands at all so it was a bit of a disaster but the actual colour was stunning on my skin. 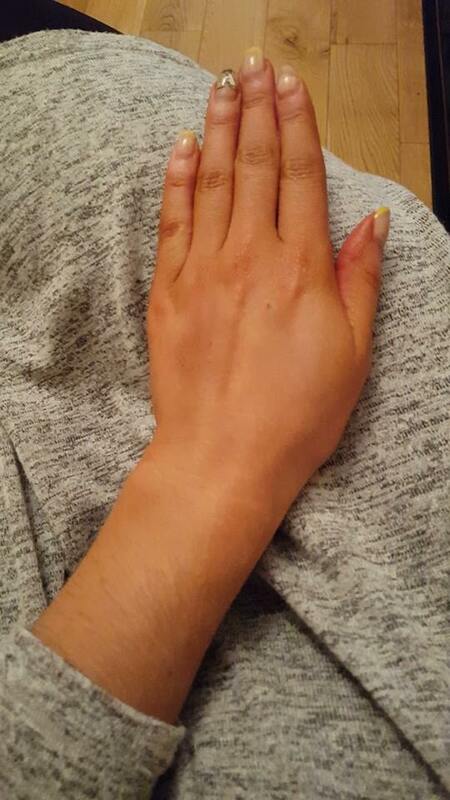 Tan can be a tricky business but Bellamianta is right up there as one of the best! 7. Fuschia Mineral Foundation: Fawn is a colour that is perfect for a night out top up. I first came across Fuschia Mineral Makeup following SoSueMe a couple of years ago. She used it as her powder for a night out. At first I thought this might mean you would be very caked in makeup but then I thought her skin always looked so beautiful and glowing on nights out that I decided to purchase it for myself. I bought my first Fawn at one of the beauty shows in a little started kit and used it almost every time I had tan on going out (which is all the time). I didn’t get a chance to pick it up again at the show so one fine day I drove the 50mins to Swords to pick it up in the Fuschia store. I wasn’t there just for that I actually went in and bought some of the pro shadows in a Fuschia style Z palette. I was watching Lauren Cleare (creator of Rebeluna Lashes) using them on a daily basis so I’ve started with three so far. They are beautiful shades so I may have to get more soon. Anyway…. Back to Fawn! As I say it’s a perfect mineral makeup in a tan shade, I have used it over many different foundations but the one I love most is over Mac Studio Fix NC30. I apply it with the infamous Blank Canvas F20 brush so ensure it gives me the coverage I am looking for. It’s definitely not for the faint hearted if you don’t like full coverage but for me it’s perfect so it’s made the Top 30! 8. 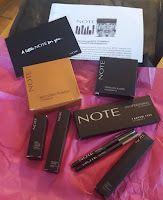 Note Cosmetics: Bronzer: Note Cosmetics is a new brand to me, new to me since just after Christmas when I was sent a lovely bundle of newbies which you can see in the big above. My favourite product has to be bronzer, it's massive! Now it does come with a price tag of around €16 but for the size of it, it will last you ages. I started to use this as my tan was wearing off so I used it all over and then as I added more tan the following week, I used the bronzer as my contour powder and it was lovely. I have researched this product as it was so new to me so I was delighted to see that it contains an SPF of 15. I haven't noticed before that a bronzing powder contains an SPF so this was a cool discovery. Note Cosmetics is available in Sam McCauley's so be sure to check them out. The bronzer is available in three different shades so you can hopefully find one suited to your skin colour. 9. Amazing Shine Lashes: Amazing shine lashes are cheap cheerful and awesome! The #43’s are my favourite style as they are so similar to the Red Cherry lashes so similar I think they are cousins or maybe even sisters. Anyway… Amazing shine lashes are believe it or not available in Mr Price stores which I am lucky enough to have one close to where I work and also at home in Waterford. The lashes cost only €2.50 or €2.99 depending where you go (they are also available in Pharmacies nationwide) and they are so good for such little money. To be fair you can probably get three to four wears out of them before they might need to get rid but with good care for €2.50 that’s really good going. They have a massive range of styles so if you like short, medium or long lashes, full or natural looking then Amazing Shine lashes have a style for you. 10. Kardashian Beauty: When Christmas comes around so too do the gift sets, there are makeup, skincare, tanning and even hair gift sets and one set I got to review before Christmas was the Kardashain Beauty Hair Gift Set. It's a fabulous black square patent bag, gold zip around and it contains a roll brush, two of the sample bottle of the black seed dry oil, the volume foam and the blow dry cream! My favourite of all the products has to be the Kardashian Beauty Smooth Styler Blow Dry Cream. It's so lovely! I use this on my damp hair on the days I try my best to style my hair properly. I usually dry my hair upside down and blast it until I can throw it back up on my head into a top knot. Anyway... this product on it's own will cost you about €13 from Cloud 10 Beauty in Ireland and I feel it really helps keep my hair smooth when I use the round brush and try make my hair straight. I have straight hair as it is but since adding colour to my hair it has of course dried out a little so there's more frizz in it now than there was with my natural hair colour. It's just joys of messing with my hair too much but to be fair since changing to using Olaplex in my colouring and styling as well as this blow dry cream, my hair can be silky smooth in no time. The Kardashian Beauty hair range was new to me but something i would really consider buying myself when I run out. 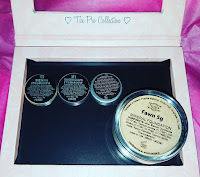 I can't believe we have come to the end but there we have it in the last three posts published to this blog, I have taken you through my top 30 products at the moment. This has been a really good post to write and I'm hoping some of you have treated yourselves to some newbie products from this list. Of course as always let me know if you have shopped. I'm always floating around my snapchat @emmajcs so that's where you see all my purchases :) By the way.... turning 30 is amazing, I have had a ball!! My Top 30 at 30 part 2! My Top 30 at 30! !